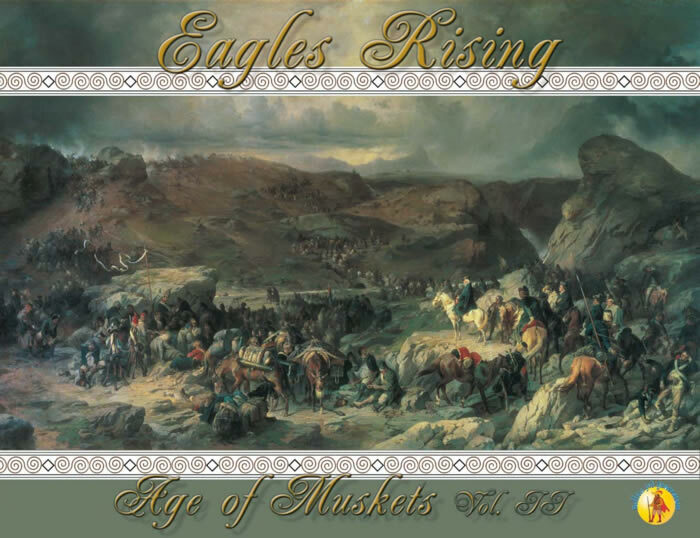 "Eagles Rising" is the second volume of our Age of Muskets Series, it covers Napoleon's Campaign in Northern Italy 1796-97. There, Napoleon made a name for himself and earned the prestige that would put in his hands the destinies of France and, eventually, of Europe. The Campaign started with Bonaparte's offensive in the spring of 1796 that knocked the Piedmontese Kingdom out of the war and subjected it to French power. Then, followed the struggle against Austrian attempts to relieve the besieged Mantua and to retake the Po River Valley that led to the Battle of Rivoli in January 1797. Finally with Napoleon's offensive in the spring of 1797 that led to Leoben (on the road to Vienna) and, eventually, to his victory over the First Coalition. As in Volume I the game includes all the elements that characterized pre-industrial warfare. However, the player will also find some elements distinctive of this campaign, as Alpine terrain, a different map and time scale to reflect the duration of the campaign as well as certain historical details (the systematic looting by the French, the revolts against French occupation ...). Given the size of the armies involved most of the scenarios of this Volume are quite adequate for two players since there are few headquarters and their size is quite manageable. However, the game title would be incomplete if it referred only to this first campaign of Napoleon. The box also includes the necessary counters and scenarios to play the Austro - Russian counteroffensive of 1799-1800 that ended at the famous Battle of Marengo, the first that Bonaparte fought and won as First Consul of the Republic after his return from Egypt. Marshall Suvorov and the Russian Army, with their Austrian allies, expelled the French from all their Italian conquests. Bonaparte's counterattack in 1800 came after Suvorov and Russia retired from the conflict but, what if things had been otherwise? You may explore this exciting possibility in the Napoleon vs. Suvorov scenario. - 1 Eagles' Rising booklet including special rules, scenarios, historical notes and designer notes. Eagle's Rising is not just a game, it's a whole gaming experience including 6 battle scenarios (Rivoli, Marengo, First Zurich, Second Zurich, Novi and Trebbia) and 11 campaign scenarios, ordered by increasing complexity, from the 2 turns of "Piedmont's Defeat" to the full campaigns of 1796-97 and 1799-1800. This includes Suvorov's campaign in Switzerland and a hypothetical campaign pitting Suvorov against Bonaparte!!!! It will be possible to put together Volume II with the next in the series: "Vienna or Death" which deals with the campaigns of 1796-97 and 1799-1800 in southern Germany with Moreau vs Archduke Charles in action. El juego está en inglés pero encontrarás en esta página (Apoyo al Jugador) los archivos en español necesarios para jugar –Hojas de Ayuda, Reglas y Escenarios.